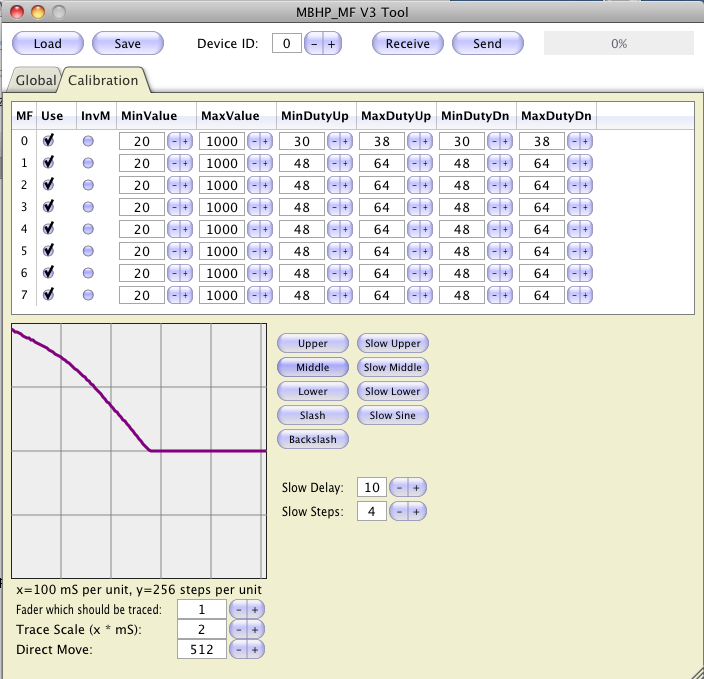 There is no real need to add more modes, considered that MIDI events can be mapped on the host PC and/or from another microcontroller (like Core32) which uses MBHP_MF_V3 as a companion. By using Pitchbender events, the highest resolution (10bit) is available. TK, I've got some Core8 and MF PCBs that were to be used for this purpose. Can I solder the Core8 board as usual? Should it be possible to fit the new circuit into the old MF PCB? When you compare the MBHP_MF_V2 schematic with MBHP_MF, you will notice that the motor control pins are now directly connected to the PIC. 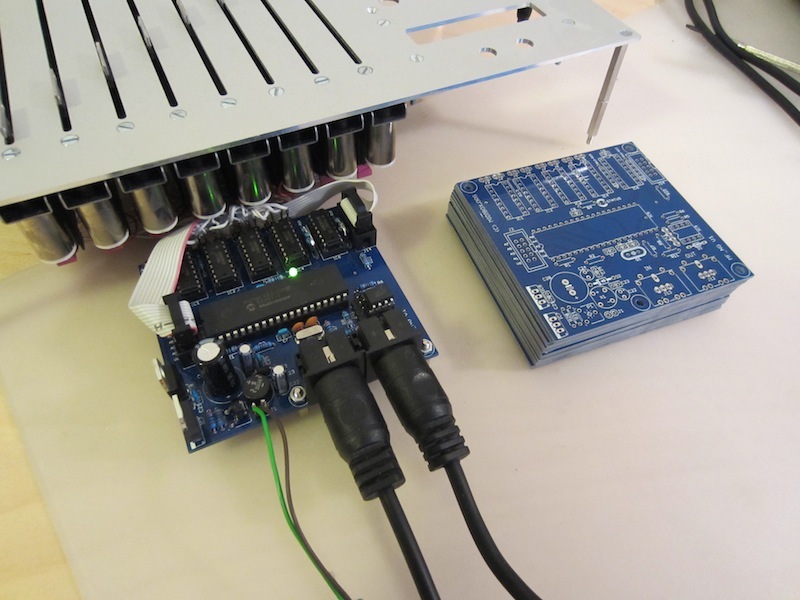 The same can be done with the old module - just remove the two 74HC595 chips and use a 16-wire ribbon cable for direct connections between MBHP_CORE and the TC4427 based H-bridges. You should also add the status LED, and a 470 Ohm resistor between the MF potentiometer (P1) and ground for improved voltage control. what about the noise of the motors during movement, the accuracy and the speed? Same as before? I haven't compared this with my RSAON11M9 faders yet, but I've the impression that the new method leads to better results, not at least because the increased PWM resolution allows more exact control over the speed so that probably *any* fader will reach the target position w/o overshoots. 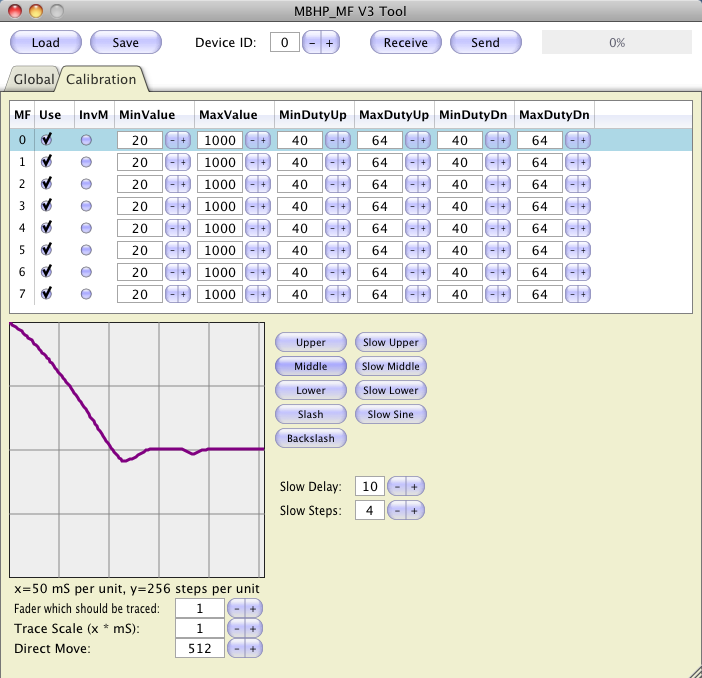 The "sine" function of the MBFM tool moves all faders concurrently with slow target position changes -> this is the noise test -> this allows to optimize parameters for less noise. Can't say more about this topic yet - after this posting I stopped the development, and I will continue in some days. havenÂ´t been around here for some ...eh.. years, mainly because my LC emulations are still working nearly perfectly and do what they are supposed to do (help making music?!). Is it necessary to use the new STM32 Core to provide the Midi I/O for the new MF Core? 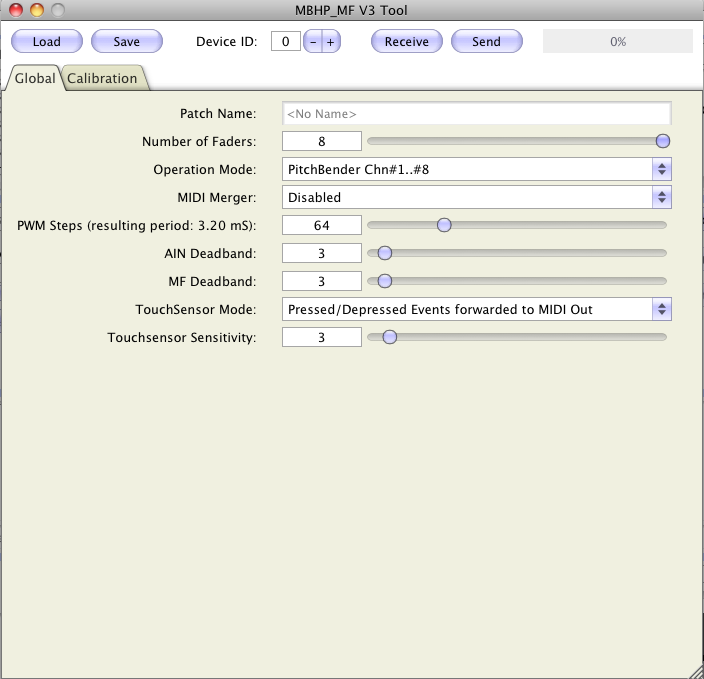 By enabling the MIDI merger it will be possible to chain MBHP_MF_V3 with a common core module. 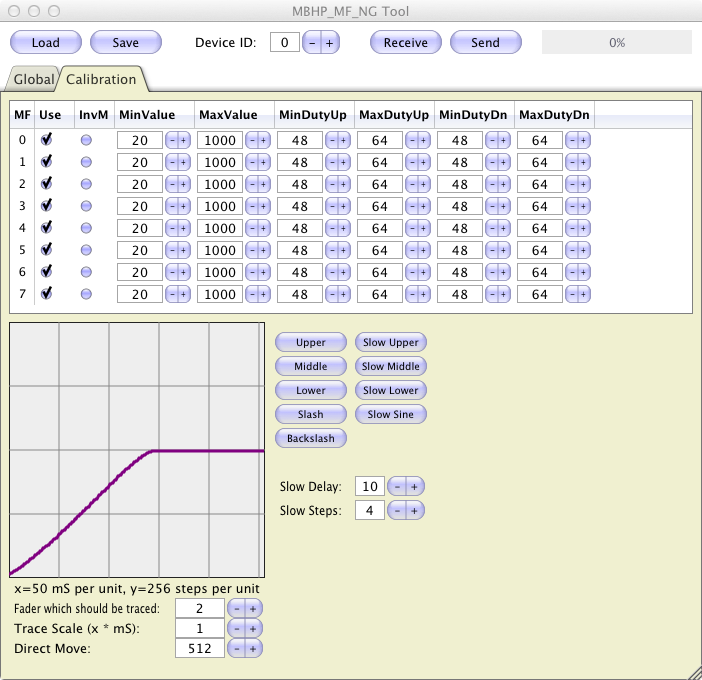 The "Faked Logic/Mackie Control" Mode will handle the Pitch Bender Events. So: a Core32 won't be required, you can re-use your existing hardware and just only have to replace the MBHP_MF_V1 module. Very impressive ! The pcb layout looks very tidy, even in prototype form. It's great that you still invest your time in this project. Apart from Tango (very expensive) and Euphonix Studio (not too sturdy looking and Mac only) controllers, there hasn't been much innovation on the commercial side, so I guess this is even a bigger incentive to build one yourself. Out of curiosity, may I ask what type of algorithm you use for tracking and control of the fader ? I guess you use of some kind of regularization of the control curve, or movement / speed prediction, so the motor speed is as smooth as possible. 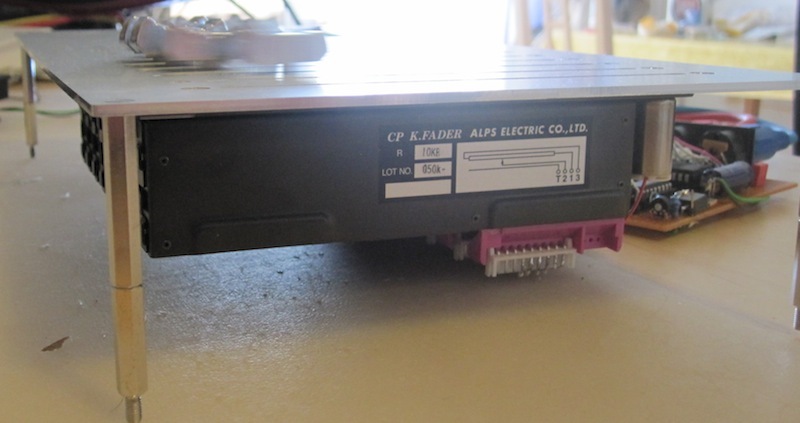 This is a ALPS RSAON11M9 fader at 5V. Such a control wasn't possible with the old solution. looks very nice, especially the time-graphs! /got to stop reading this thread, says my wallet. Greetings! 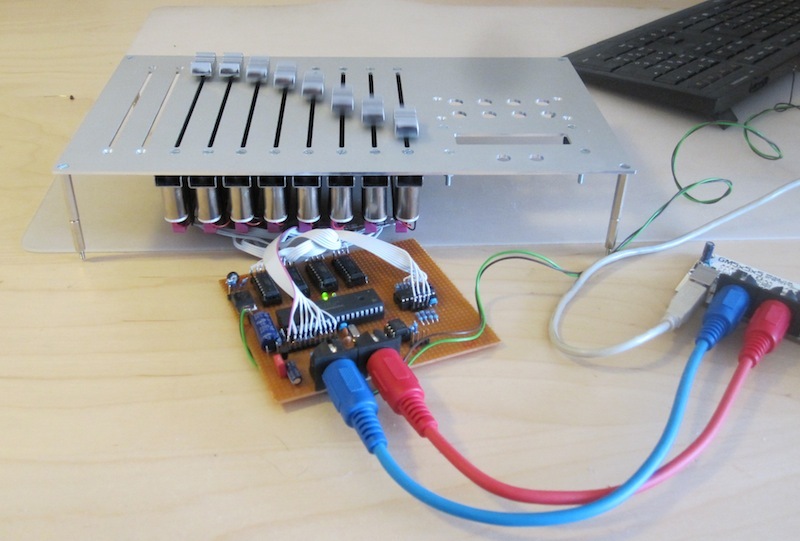 I've been doing a lot of reading about the midibox project and I think I'm about ready to take some steps. I'm particularly interested in this new MF V3 board. Any further progress made as of yet? I haven't continued yet as this is a low-prio project for me. My Core32 based MBLC is already stuffed with a module, communication goes through a STM32 module via USB to Logic Pro - it works perfectly. I built a second module for testing different faders, but haven't found the time yet to run the tests and to find + document the best calibration values. However, if anybody wants to build this on a veroboard: just do it! The schematic is final, the firmware is released in the repository and I can send you an MIOS Studio update for calibration (or you can compile it by yourself). (or you can compile it by yourself). Anyone know how to compile MIOS Studio on windows? I will try and build it tomorrow and update SVN. If you update your SVN repository, you should see a new build directory for VS2010 which will hopefully work for you! Try Juce 1.50 (as that is the recommended version). Juce seems to change prototypes between versions so it is likely that the definition for TableHeaderComponent has changed! Once I update to a new version and change the source codes accordingly, previous Juce releases won't work anymore. Looks for the first sight more easy to built for a DIY beginner! Maybe a noob question, but in the future I want to make a controller for ProTools, so it has to be a HUI, am I right and is this possible? I never tried ProTools by myself, but I think that it will work fine in "Logic/Mackie Control Emulation mode". is there a netlist of the MF V3 board available? IÂ´m planning my first midibox(es) since a few months now and would like to try a PCB layout for the new MF boards. Of course I could just use the schematic and do it from scratch but I thought itÂ´s worth asking to save some time. SmashTV created a netlist + Eagle layout, just contact him, you could help with prototype testing if you are able to etch the PCB by yourself. this is good news! I will contact SmashTV and will be very happy to test the PCB layout. As for faders IÂ´m gonna use good old ALPS RSA0N11M9A06, so not too much betatesting here... IÂ´ll keep you informed.